This literary travel book takes you on a journey from southern Sweden up to Norrland, from the farmers of the region of Skåne to the Sami in the far North. Lars Gustafsson and Agneta Blomqvist go on excursions into the woods and moors, to pick mushrooms and berries, to see wolves and bears. They visit a famous bakery and the grave of Tucholsky and immerse in Swedish history. The authors also take you to the places they call home: the fjord in Bohuslän, Läke Mälaren and the capital of Sweden, Stockholm. Their interwoven voices and experiences bring the Sweden of the past back to live and connect it to the Sweden of today. Through excursions into art, literature and history, Smile of a Midsummer Night allows you to get more than a glimpse of Swedish traditions and their old but still told tales. The authors: Lars Gustafsson was born in 1936 in Central Sweden. Today the poet, philosopher and novelist lives back in Sweden again, after working in Austin, Texas for many years. 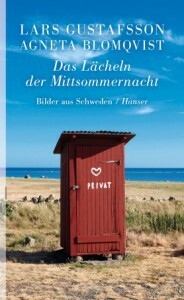 His last publications at the Hanser Verlag are „The Man on the Blue Bicycle„, 2013, and „Smile of the Midsummer Night„, 2013, which he wrote together with his wife, Agneta Blomqvist. Agneta Blomqvist was born in 1942. She is a teacher of Religion and Literature and the editor of a major encyclopaedia of literature.